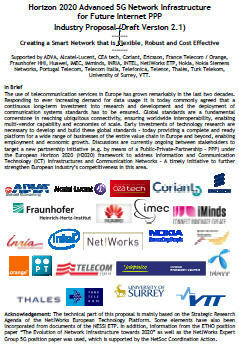 A group of industry companies has prepared a draft PPP proposal following a template provided by the EU Commission. It addresses the overall long-term vision of the PPP, the strategic and specific objectives of the PPP and the research and innovation strategy, in particular the scope of R&D and innovation challenges. An important part of the overall evaluation process of PPP proposals is a public consultation with a wider community on the intended technical content of the proposal. As this PPP should have its roots in the Net!Works ETP the consultation was done with the Net!Works community. This consultation was opened on 10 May and has closed on 27 May 2013. The processing of comments has been organised by the Chairman of the Net!Works expert Group, Prof Rahim Tafazolli, University of Surrey. Based on the comments a revised version of the proposal has been prepared and was submitted to Neelie Kroes on 20 June 2013.